Jan Bulkley Gilyeat, 64, of Gilbert, Arizona was born in Ogden, Utah on July 12, 1953 to Arthur Vernon Bulkley and Lylas June Alldredge. She passed away peacefully on May 11, 2018 in Phoenix, Arizona. As a lifelong member of The Church of Jesus Christ of Latter-day Saints, she actively shared the Gospel in everything she did. She traveled the country with her parents as a young girl while her father built church houses. Jan danced her way through life, including appearances on American Bandstand. In the midst of raising five children, she became step-mom to four more children. As a parent to 9 children she was the ideal wife, mother, and grandmother. She served her community in Cub Scouts, PTA, Youth Soccer and many church organizations. She directed a 90 voice combined choir consisting of members from the LDS Gilbert Stake and St. Anne Catholic Parish for many years. 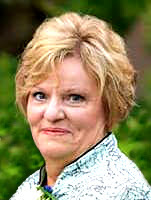 Jan is survived by her husband, Ian Gilyeat; their nine children, Jennifer Homer Barnes, Jacob Homer, Brandon Gilyeat (Joy), Cassie Homer Eagar (Kevin), Zachary Homer, Sean Gilyeat, Adrian Gilyeat, Juneanne Homer Fisher (Michael), and Tialene Gilyeat; seven grandchildren; and two brothers, Kent Bulkley (Karen) and Lynn Bulkley (Sini). Jan was preceded in death by her parents; a brother, Van Bulkley; and sisters, Jeanene Bulkley and Verlane Bulkley. Such a surprise. Wishing the best of comfort to the family! You will forever be in my heart my friend. Thank you for the years of your friendship. I will always love you and appreciate all you did for me. You will be missed !